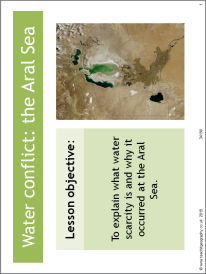 This resource looks at the issues of water scarcity by focusing of the issues of water conflict in the areas surrounding the Aral Sea. Students complete a causes and effects categorising task and a decision making task looking at solutions. A structure strip is included to assist students with this written task.